We’re constantly on the lookout for the newest, emerging Bees, Wasps, Hornets & other Stinging Insect Pest Control Products and Services. Why not sign up here and be notified as when we’ve updated our offerings? You can use this handy form to the right. If you have a specific question about any of our Services or the products we use feel free to contact us, we’re here to help you stay Bee, Wasp, Hornet & other Stinging Insect free! We believe in informing the customer and allowing them to make an informed decision. This information is by no means exhaustive. If you have any Bees, Wasps, Hornets & other Stinging Insect questions that you don’t see covered here please feel free to use our handy form or give us a call. Cicada Killers: These large solitary wasps, about 1 1/2 inches long, hunt cicadas and put them in burrows as food for the young. Rarely sting people, but their burrows damage lawns. Umbrella or Paper Wasps: These slender, reddish or brown social wasps build small nests shaped like an inverted umbrella, often under eaves. Can be dangerous when they nest near doors and windows. 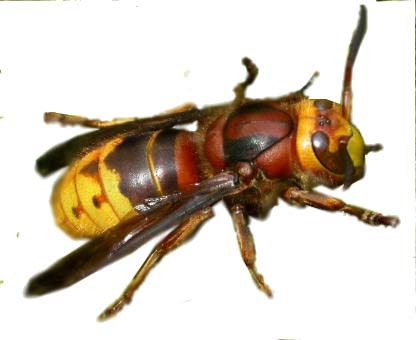 Hornets: Larger and less distinctly striped than yellow jackets. European hornets nest in hollow trees and attics. Bald-faced hornets build exposed nests which hang in trees like large grayish footballs. Both these social wasps are very aggressive. Yellow Jackets: These black and yellow striped social wasps are small (workers about 1/2 inch long), but their large nests may contain over 5,000 individuals. Nests are concealed underground, or in hollow trees, wall voids and attics. They often scavenge around food facilities and trash containers and sting repeatedly with little provocation. 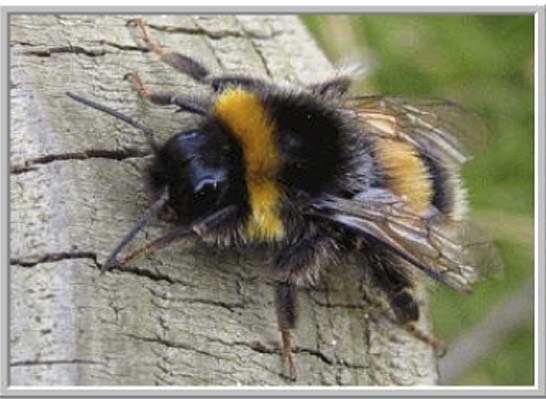 Bumble Bees: Resemble carpenter bees but top of abdomen is hairy, not shiny. Social insects, forming small colonies, mostly underground. Can be pests when nesting near sidewalks or where children play. 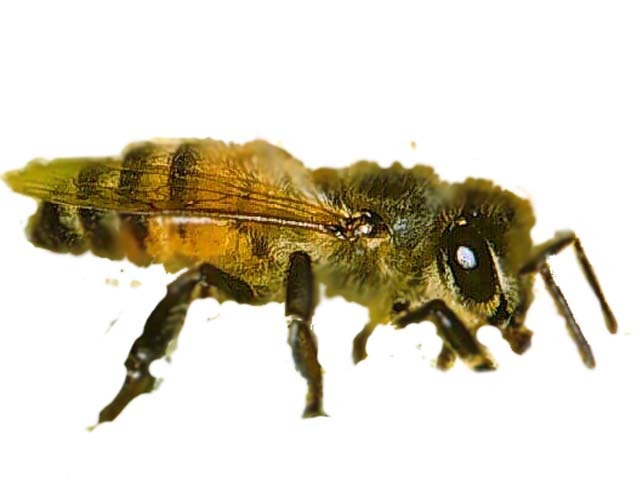 Honey Bees: Yellowish to blackish, with workers about 2/3 inch long. They are the most common social bees, vital for pollinating wildflowers and crops and for producing honey. They are unique in forming perennial colonies, using stored honey as food in adverse weather. Can become pests by nesting in wall voids. They are not very aggressive, and their barbed stinger stays in the wound, so they only sting once. Carpenter Bees: Solitary bees, usually darker and larger than honey bees. Each female chews a tunnel in wood in which she lays a row of eggs, sealing each egg in a cell with food derived from pollen and nectar. Nest tunnels are about 5 inches long, with an entrance about 1/2 inch wide. Tunneling by many bees over several years can cause major damage to siding, window sill, eaves, outdoor furniture and fences. What Can You Do Against Bees and Wasps? Bees and wasps should only be controlled when they are damaging property or endangering people. Too often, bees and wasps are killed when they pose no threat and may be beneficial. For instance, the large, dark, hairy wasps seen hovering over lawns may be digger wasps, which generally don’t attack people but are very useful in getting rid of beetle grubs which attack grass. Even when bees and wasps are really pests, homeowners should be wary about tackling them because of the risk of people being stung. Some over-the-counter pesticides make bees and wasps more aggressive and may cause them to surge out of their nests, stinging not only the pesticide applicator but anyone else nearby. Some pesticides may also make treated nests repellent so that bees and wasps mill around disoriented, perhaps entering nearby buildings and causing a greater nuisance. 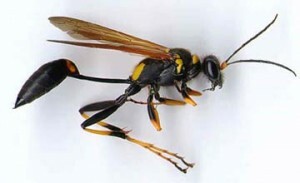 Nonchemical measures, such as knocking down nests of umbrella wasps from the eaves, may also be ineffective – the wasps may quickly rebuild their nests. However, here are 10 measures you can take to reduce problems from bees and wasps. 1. Eliminate problem plants close to the home, including certain flowering plants which attract bees and some plants producing honeydew or fruit which attract yellow jackets. Also, remove hollow trees where they might nest. 2. Seal crevices and screen vents which allow bees and wasps to establish nests in wall voids, eaves or attics. 3. 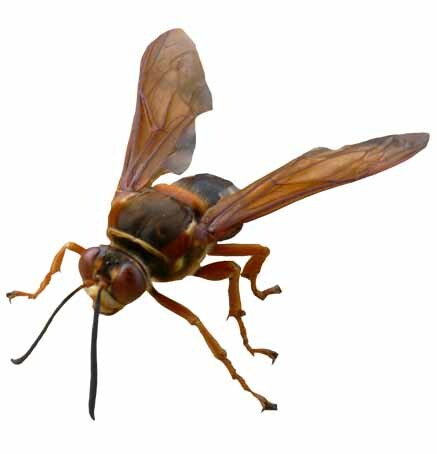 Eliminate unnecessary exterior lighting, especially near doorways, since this attracts hornets in summer and fall. 4. 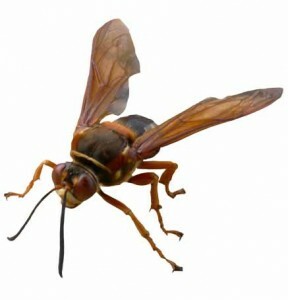 Keep windows and doors closed or screened, especially during periods when social wasps are most busy scavenging. 5. Cover food and garbage which attracts wasps. 6. Where possible, avoid carrying sweet foods or drinks outside where wasps are foraging. Set down and leave any food attracting wasps. 7. Avoid sitting near trash barrels or food stands in parks, since these are often visited by wasps. 8. At picnics, check for bees and wasps before sitting on the ground, and check each mouthful when eating or drinking. Stings inside the mouth and throat are particularly dangerous. 9. Minimize use of perfume, after-shave or scented talc, which attract some insects which forage on flowers. If pestered, don’t flap at wasps – leave the area or go indoors. 10. Be cautious near nests. In particular, don’t cast a shadow on the nest, keep out of insect flight paths and walk softly near ground nests. 1. Bees and wasps are related to ants and fossil evidence indicates they originated about 180 million years ago. 2. There are several species of bees and about 4,000 different species of wasps in the U.S.A. , including yellow jackets, hornets and cicada killers. 3. Many species of bees and wasps are solitary insects, but others are social insects, nesting together in communities comprising a queen and numerous workers. 4. Nests of some social wasps may contain 5,000 workers, while a large nest of honey bees may contain over 50,000 workers. 5. Wasps are scavengers and predators, the adults feeding on fruit juices and other sugar-rich liquids, and hunting for spiders, insects and other protein-rich materials to feed wasp larvae. 6. Bees collect pollen and nectar which is eaten by both adult and larval bees. Honey bees convert some nectar into honey which is stored and eaten later. 7. 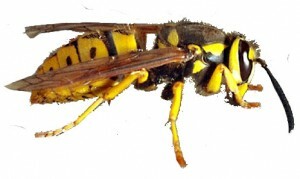 Yellow jackets and some other social wasps can cause food contamination when they scavenge on human food. 8. Bees and wasps cause many auto accidents when they get in vehicles and distract drivers. 9. Some bees and wasps regularly cause damage to lawns (e.g. burrows of cicada killers) and to buildings (e.g. carpenter bee tunnels in siding). 10. Bee and wasp stings kill about 40 people each year in the U.S.A. Sensitive people can die within 15 minutes of being stung, and many sting-related deaths may be misreported as heart attacks. If you’re interested in the Stinging Insect Pest Control Service offered by Termite Terry please feel free to call us at 949-631-7348 in order to set up an appointment or use our online Order Form and we’ll get back to you as soon as possible.